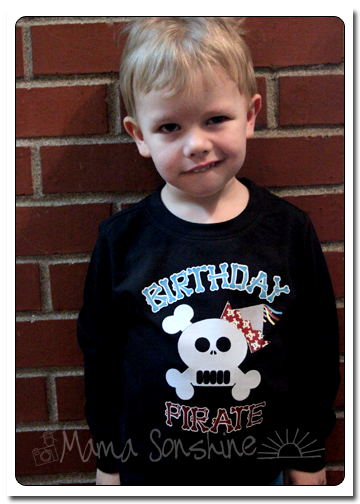 I wanted to share with you the steps I took to make my son’s birthday shirt. There was a few problems I had that I was able to work through. Hopefully this will help so others won’t get stuck like I did. 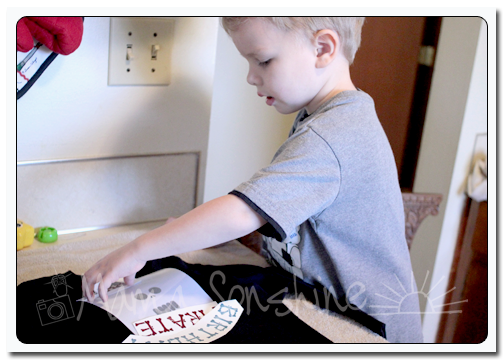 In this tutorial I use my Silhouette Cameo and the Silhouette Studio DE software to make a custom shirt for my son’s birthday party. 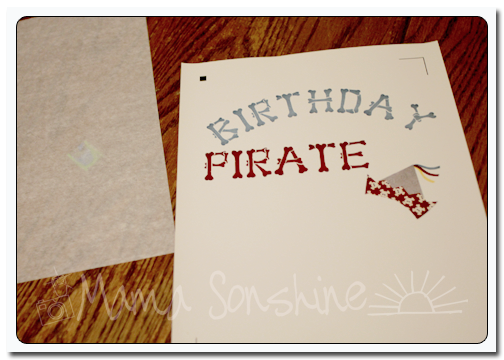 I used graphics from Just So Scrappy‘s YoHo YoHo Pirate kit. 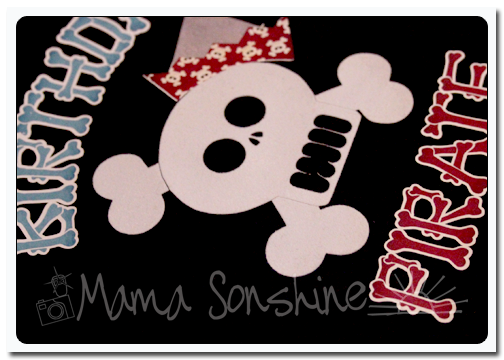 I used the Silhouette brand Flocked Heat Transfer Material for the skull, and Avery Dark T-Shirt Transfers for Ink Jet Printers. Part Three will be how to iron everything on and some tips. My first tip; if you want your words to be in the correct direction I would advise you not to let your three-year old place them on the shirt. The flocked transfer material has a clear plastic film over the top. This is the side you face down when cutting, you want the Silhouette to cut through the transfer material but not this film. After weeding out the areas that you want the shirt to show through, lay your transfer material with the film facing up. I would advise ironing on one piece at a time, just to ensure proper placement. Use a dry iron, on the highest setting (please read the directions that come with your material) and a piece of thin cotton fabric between the iron and your material. I used a pillowcase after determining a dish towel was too thick. You want to apply a lot of pressure for up to a minute, or more. Again, this is where you want to double-check the instructions that come with your material. The time can very depending on manufactures, but the main thing is if isn’t sticking, you need more time and pressure. 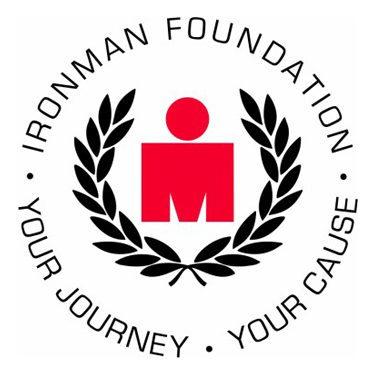 Try not to move the iron around like you are ironing your clothes. Just hold for a minute, then move to another area and hold, with lots of pressure. Have I made it clear that pressure is important? Some material is cool peel, meaning you need to wait until the ironed on design has cooled before removing the top film. If this is the case, wait! You will only ruin your design if you get impatient. The intricate cut around the words was done as stated in the previous tutorial, but I wanted to separate the words from the page and lay them on the shirt without yet removing the backing, so I just cut them out with scissors. The Silhouette settings I used made a ‘kiss cut’ meaning it cut through the transfer material but not through the backing. When you are ready to iron on the material you peel it off like a sticker. After placing the elements where you want them use the same iron settings but use the piece of parchment-like paper that comes with the printable transfers between the material and your iron. Again using lots of pressure. Also, make sure something is covering the areas that have already been ironed on. If you apply direct heat to this material you could melt it. As I have stated above I used the printable material for dark fabric and ink jet printers. The dark fabric is like a sticker. What is face up is what will show, this is different from the material for light fabric. The dark fabric material also leaves a white area on the printed material where there is a white area on your screen. With the light fabric material, where there is white on your screen the shirt fabric will show through. This is something to consider before purchasing your transfer material. Also it is very important for you to know what kind of printer you will be using. The way an ink jet and laser printer adhere the ink to the paper is different and for this type of material it does make a difference. The first time I printed this out I used a laser printer without thinking of the consequences. It looks fine, there wasn’t any difference between it and the one I ended up printing on my ink jet printer. At least not until I ironed it on. See how the hat has faded? This is because of the toner in a laser printer. 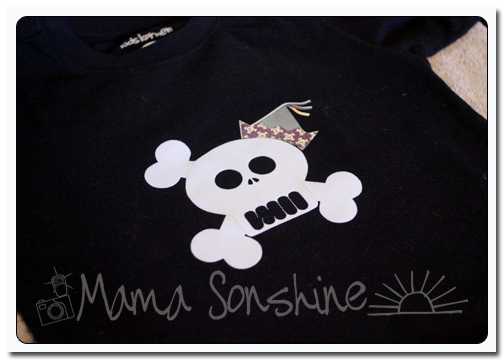 It can come off the printable heat transfer material when heat is applied. I had to go back and reprint everything on an ink jet printer. At this point I also had to make the hat a little bigger to cover up the faded one. But the end result was still one happy birthday-boy-to-be. 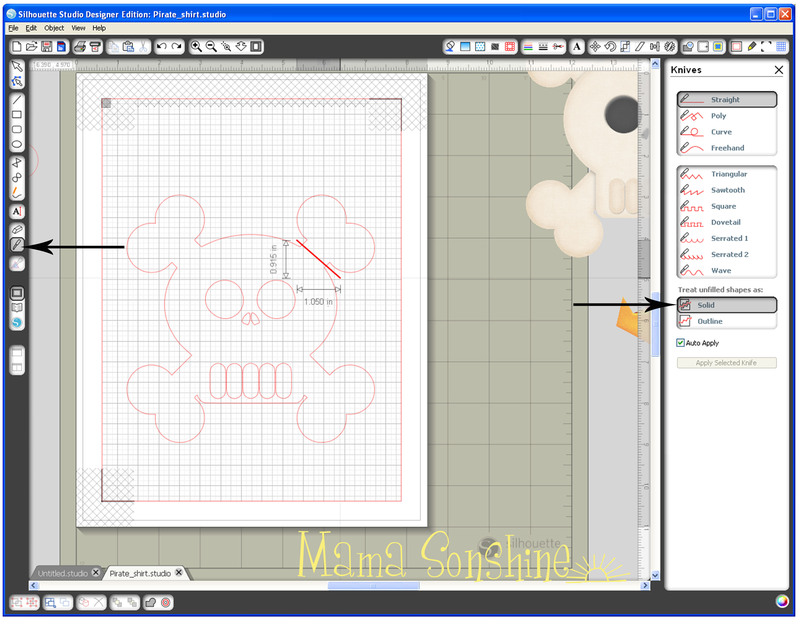 If you want to see how I designed the skull check out Part one. If you want to see how I designed the print and cut words and hat see Part Two. 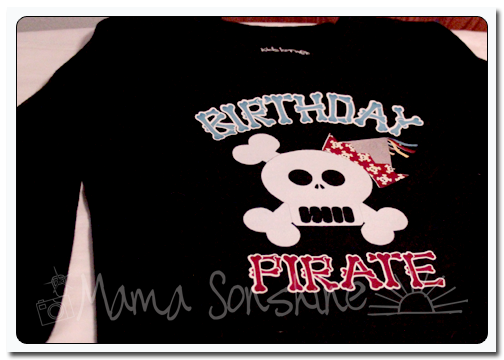 Categories: Birthday, Birthday Party, Parties, She's Crafty, Silhouette Crafts | Tags: Birthday Shirt, Birthday Shirt Tutorial, Children, Crafting, DIY Shirt, Family, Heat transfer, Heat Transfer Tutorial, How to Offset text, Inkjet printing, Iron, Print 'n cut, Printable Heat Transfer, Shirt, Silhouette, Silhouette America, Silhouette Cameo, Silhouette cutting machine, Silhouette Fabric, Silhouette Fabric Ideas, Silhouette Studio Software, Silhouette Studio Tutorial, Text on a circle, Toddlers, Tracing Silhouette Studio | Permalink. This part of the shirt was made using printable heat transfer material for the Dark Shirt Transfer Material and an Ink Jet printer. 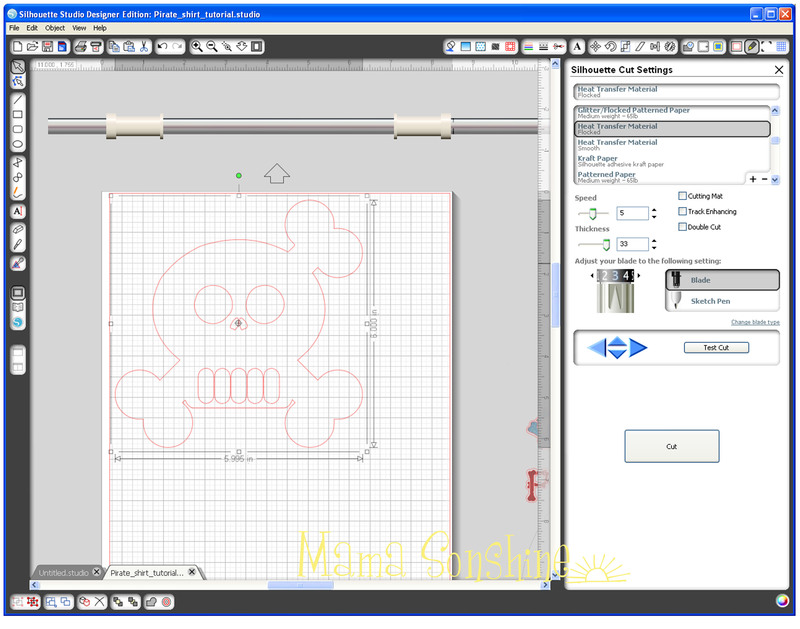 The HTM for light material is different and the steps you take to print and cut are different. Also be sure you know what kind of printer you are going to be using, either ink jet or laser, and get the appropriate transfers. The way the ink sets on the paper is different, if you use a laser printer on the ink jet papers your color will come off when ironed. 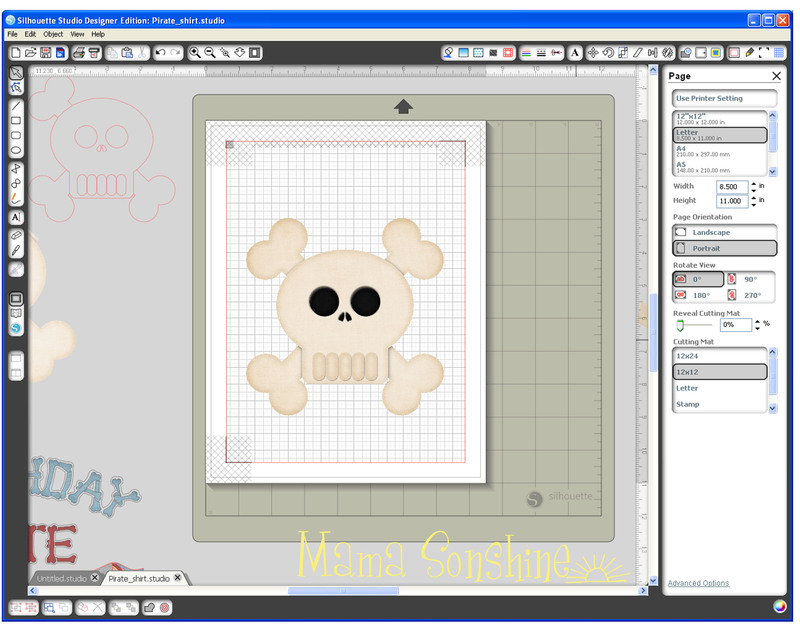 In the studio software I used the same file I had open for the skull & cross-bones because I needed the skull for a size and placement reference. When I didn’t want it on the screen I simply moved it off the mat. 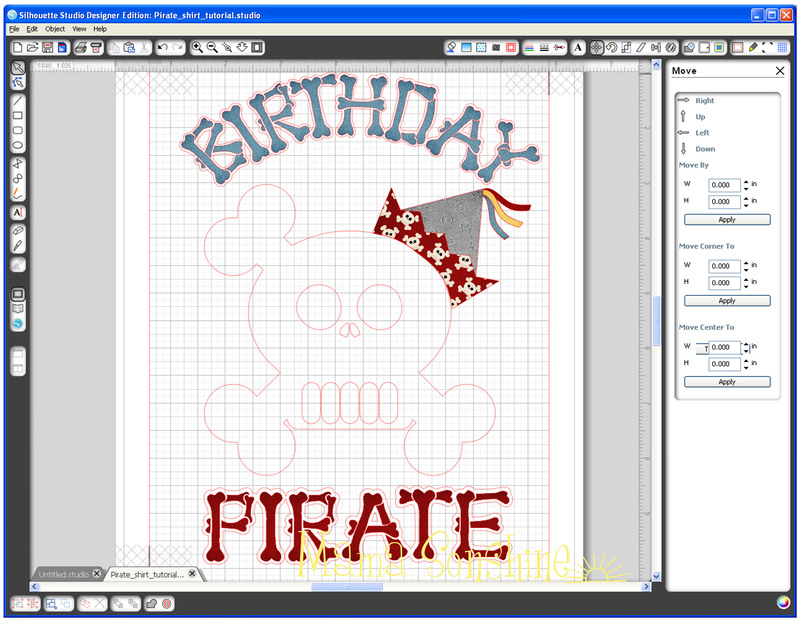 I wanted a birthday hat shape that I could fill with a pattern, using the digital papers from the YoHo Pirate kit mentioned above. I chose a party hat .png file I had because I liked the shape. 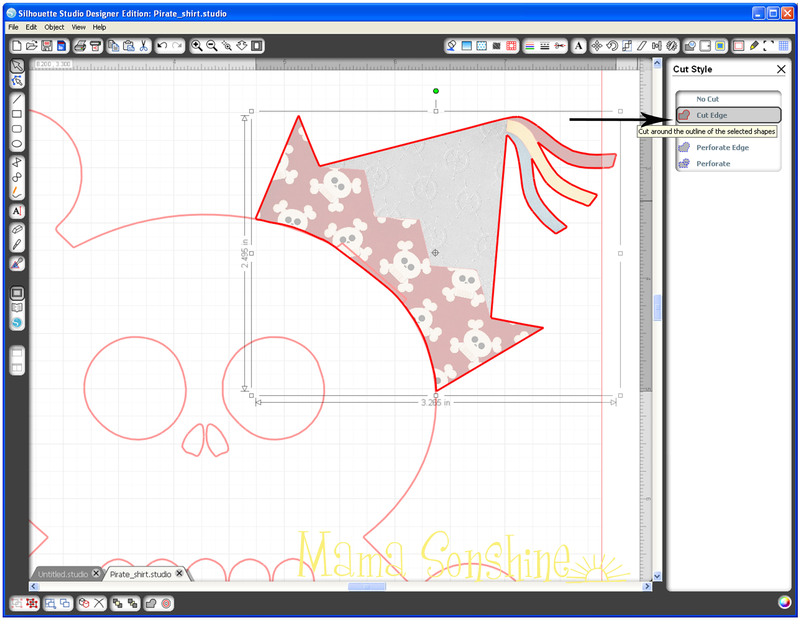 Since I don’t want the pattern or colors that are currently I made a new cut file using the .png as a template. I wanted to make the stripe portion one pattern, the yellow portion a different pattern, and I wanted to change the color of the ribbons. The trace tool could not cleanly make these five individual elements. Even when I selected trace instead of trace outside edge, I still only got the outside edge traced. I found it more difficult to try to trace each portion than to simply make a new shape. I selected the draw polygon tool and made a new shape for the yellow portion of the hat. 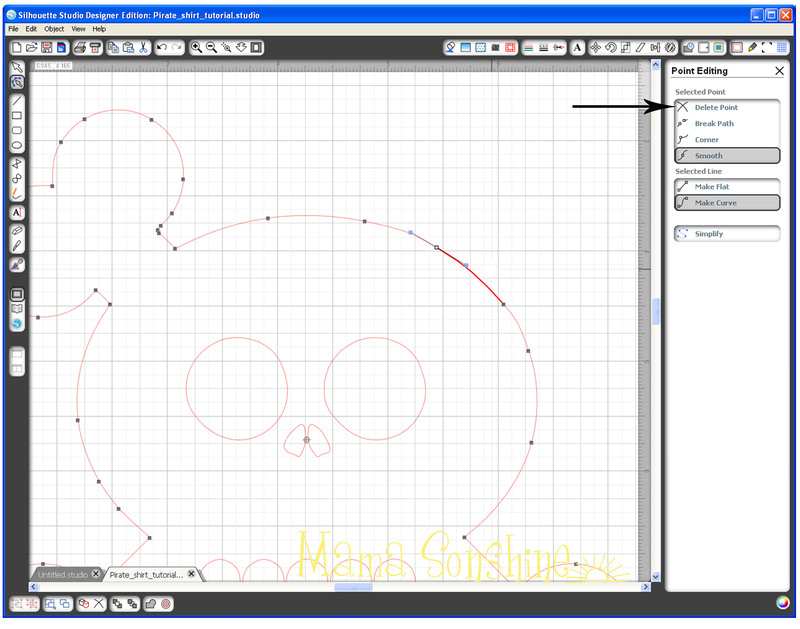 It is important not to move the picture after tracing it and drawing the shape. You also don’t want to use the line tool, because you want an element that can be filled with a pattern. I used the draw curve tool to make the three different ribbons on the top of the hat. Again, the ribbons are three different shapes that sit on top of the traced hat. After this you no longer need the picture of the hat, so you can delete it or just move it off the page. 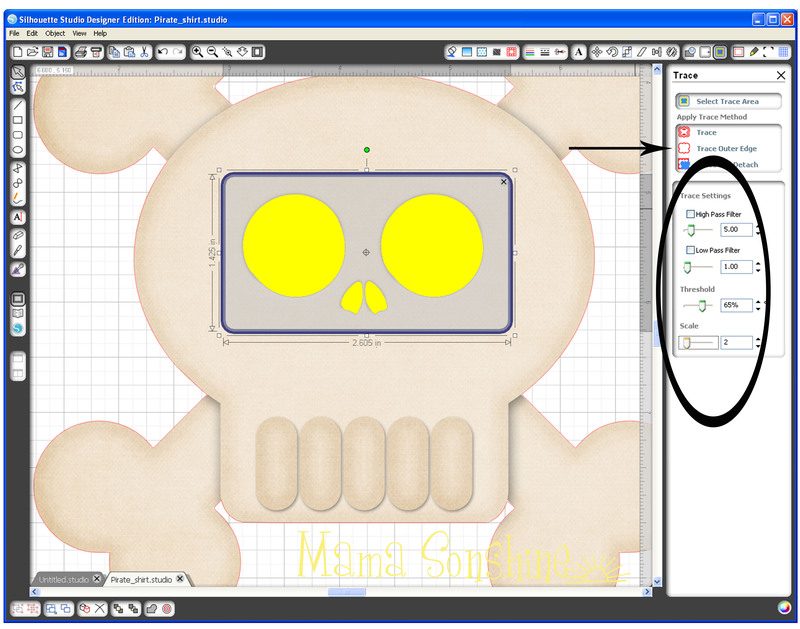 Use the fill pattern window to select the patterns for each element. Bring back the skull & cross-bones to fit the hat on the skull. Select all five elements of the hat, re-position and re-size the hat until you get the look you want. Unselect all elements, then select only the bottom border of the hat, here the red portion. Use the point edit tool to fit the hat to the shape of the skulls head. At some point you may also need to edit the points of main hat shape. 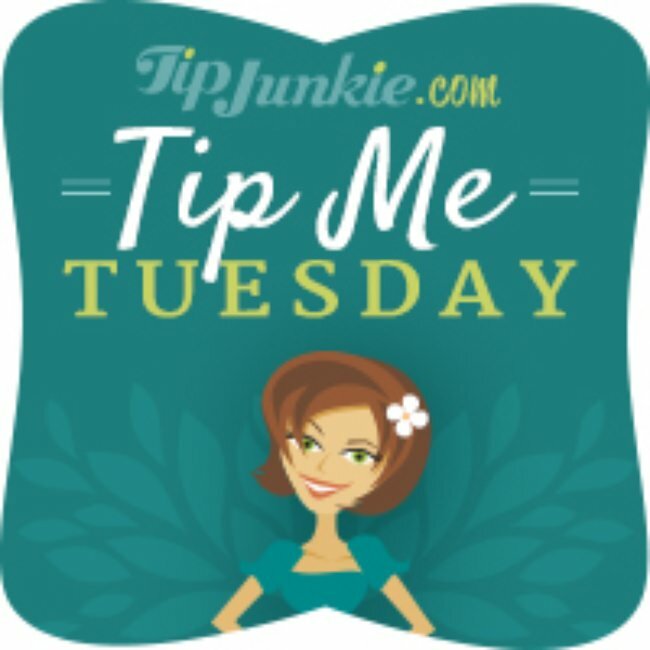 Once you have the hat fitting the shape of the head go to your cut style tool box because you don’t want the elements of the hat cut in separate pieces. 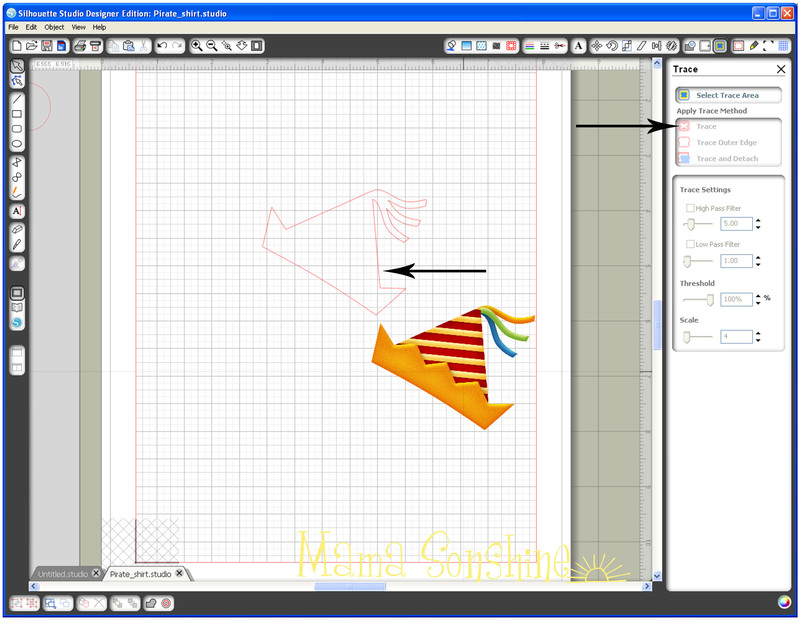 Select all the elements, and select no cut, then select only the main hat shape and select cut edge. This ensures that you are only going to cut around the hat’s edge after printing. Select the five elements of the hat and group them together, you don’t want any of them moved away from each other now. First I wanted the word birthday to be arched, I drew a circle, typed the text then dragged the text to the circle using the little circle with a cross inside. 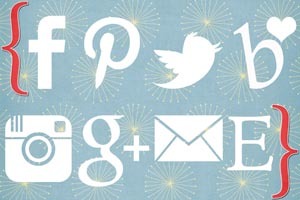 Resize and move the text until you get it the desired results. If the green outline and move tool go away because you had to select off the text, just double-click the text till they come back. I had to move the skull off the page, because the text kept trying to link with it instead of the circle and move it back to fit the text to the skull size. This next part is where I had the most difficulty. I really liked this Bones font I found, the problem is that each letter has little bones that would be cut separately. This would happen even if cut edge was selected, because the software sees each bone as a different element. After hours of trial and error I finally figured out the simplest way to cut around the word, and not each individual letter or bone. The first time I did this I took a very long route to get where I wanted. I released compound paths, duplicated, filled patterns, made new compound paths, welded, grouped, un-grouped, made offsets, moved, re-sized, moved again, etc. After I got the result I wanted I realized I was adding a bunch of extra steps. First select your text and go to the offset tool box, create an offset and adjust size so it is just slightly bigger than your text. If you are using the dark T-shirt transfer material your offset will show as white, so it is up to you how much white you want to show. At this point each letter will cut out separately, which I didn’t want because I didn’t want to align them on my shirt, I wanted the whole word as one element. So I move my text up slightly to work with my offset. I moved each offset letter closer to each other with a very slight overlap so I could weld them together. The offset and the text no longer match up, so you may have to ungroup your text to move each letter back to the offset, but do not release compound path. 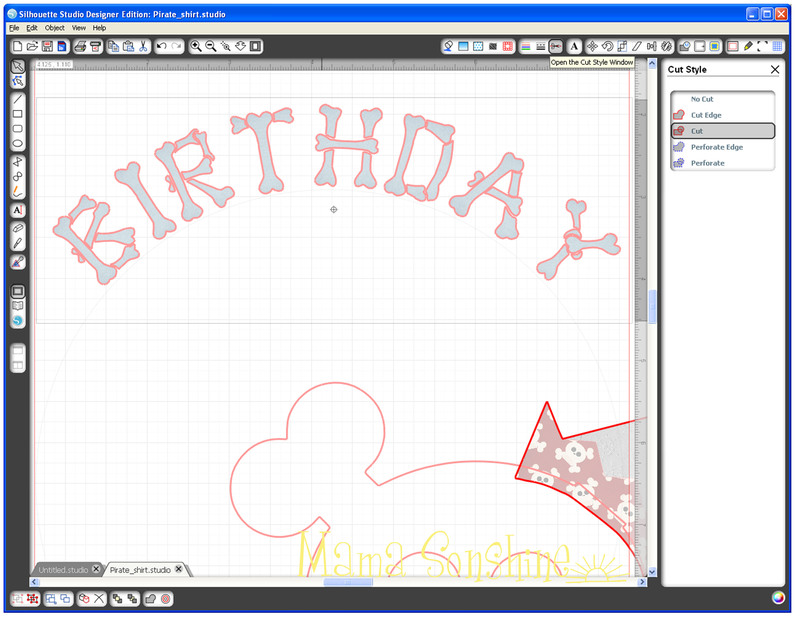 Choose a pattern to fill the text for printing. Go to the cut style window and select all the letters of your text, then select no cut. Select the offset and cut edge. You will see that your machine will now cut around the letters as one piece. Repeat the steps for your second word and align everything, including the skull, to make sure size and proportions look good. 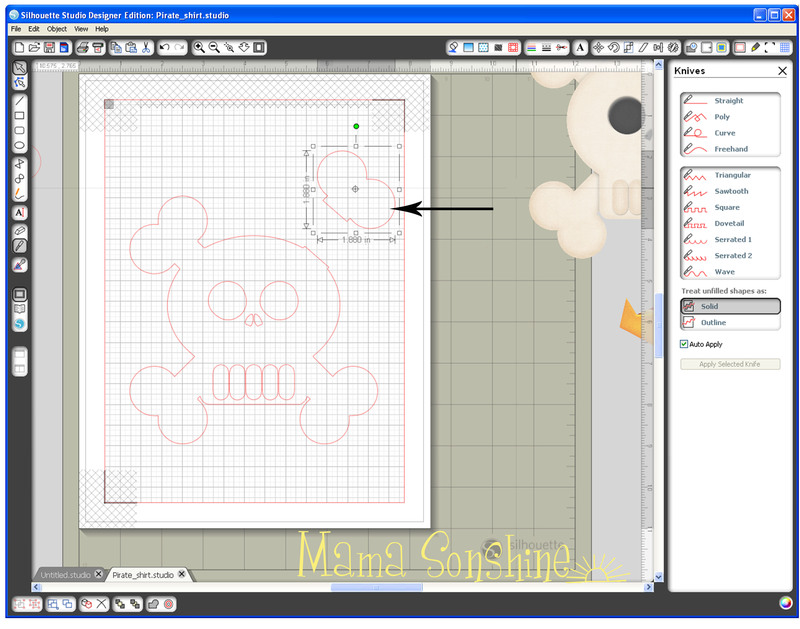 Since the skull is not part of the print ‘n cut, you would move it off the page. 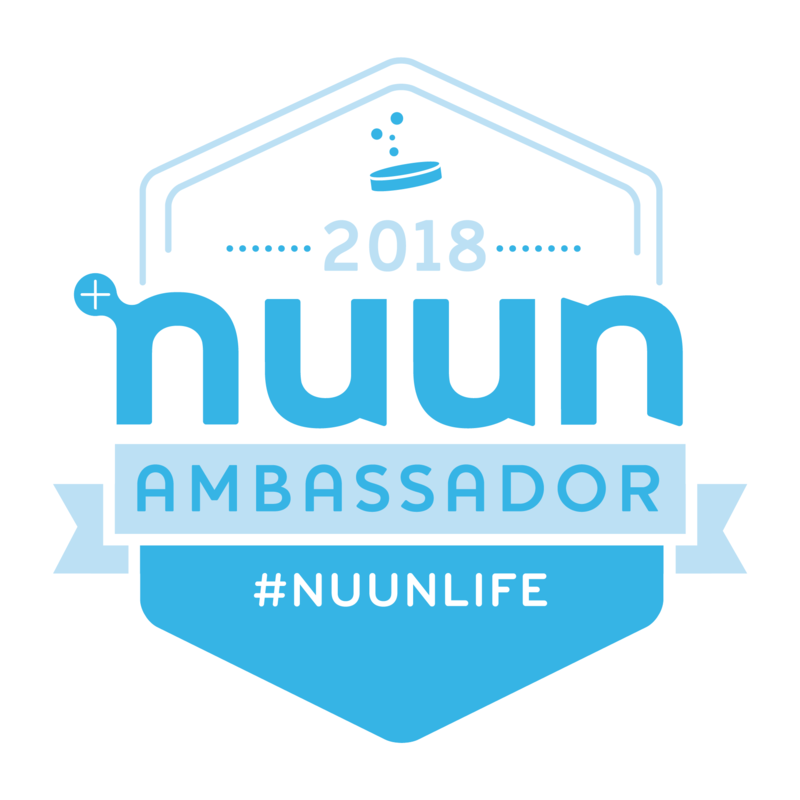 Show registration marks and move your elements on your page for printing. Just make sure your hat elements are grouped together and the text and offsets are grouped together. 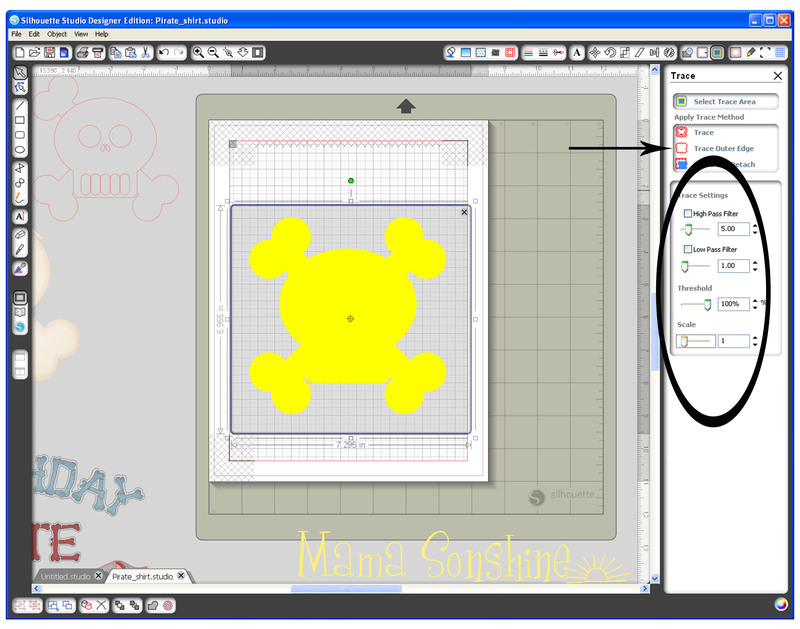 After printing, do not move anything, it will need to be in the same location for cutting. 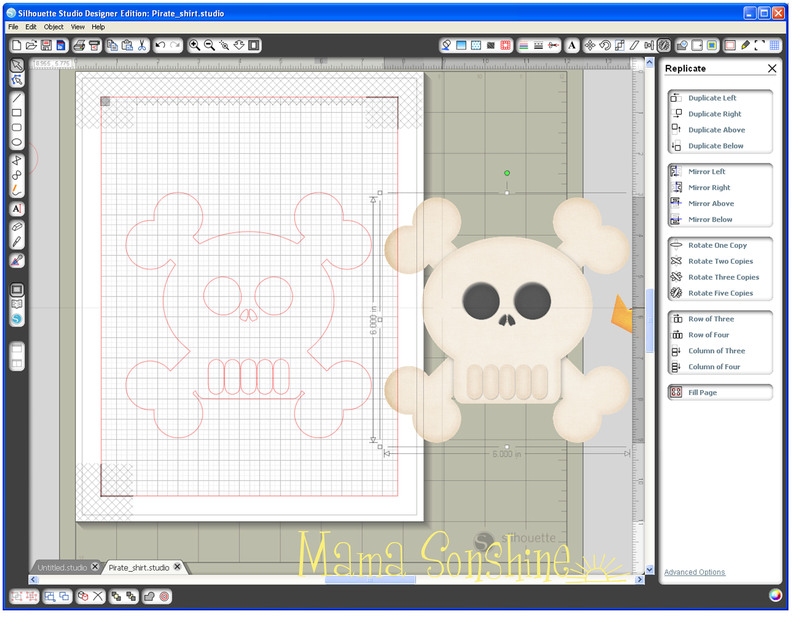 I found the cut settings for Silhouette Studio has for printable heat transfer-dark material worked great. For the rest of the shirt check out Part Three. 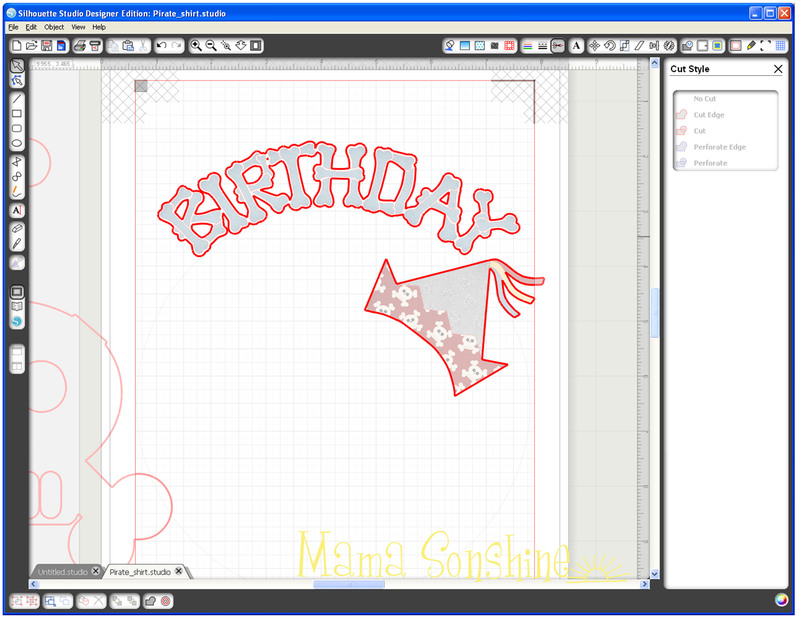 Categories: Birthday, Birthday Party, Parties, She's Crafty, Silhouette Crafts | Tags: Birthday Shirt, Birthday Shirt Tutorial, Children, Crafting, DIY Shirt, Family, Heat transfer, Heat Transfer Tutorial, How to Offset text, Print 'n cut, Printable Heat Transfer, Silhouette America, Silhouette Cameo, Silhouette cutting machine, Silhouette Fabric, Silhouette Fabric Ideas, Silhouette Studio Software, Silhouette Studio Tutorial, Text on a circle, Toddlers, Tracing Silhouette Studio | Permalink. 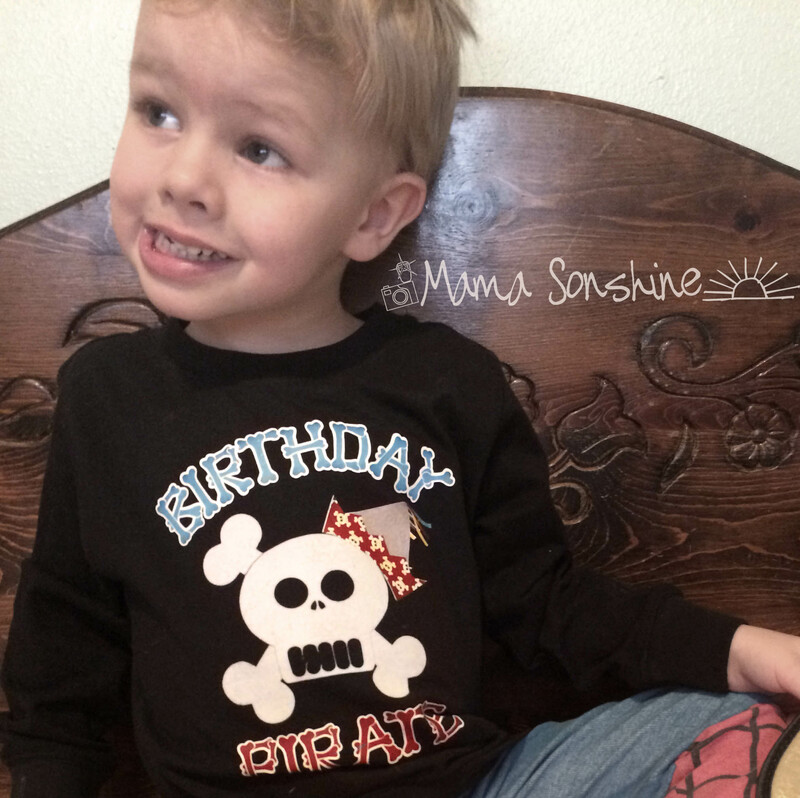 I wanted to share with you the steps I took to make my son’s birthday shirt. There was a few problems I had that I was able to work through. 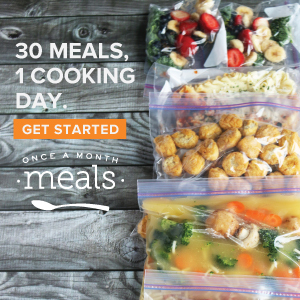 Hopefully this will help so others won’t get stuck like I did. The flocked heat transfer material I had is 9″ wide, I set my paper size to normal Letter 8.5″x11″ since I will also be doing a print ‘n cut portion for his shirt. Keeping the size the same helped me with proportions. I selected the skull and cross-bones from my library. Since it is a .png file I had to trace the element. 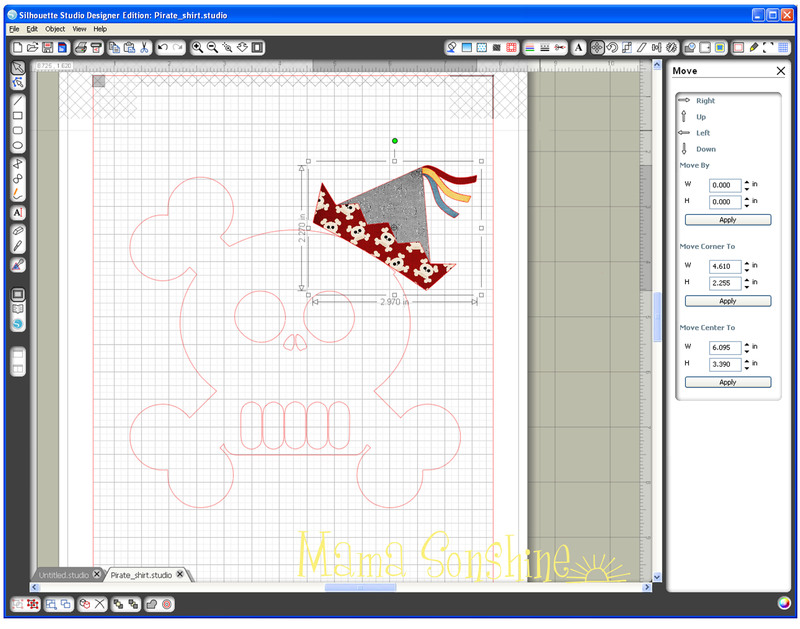 I planned on cutting the skull out of the flocked heat transfer material, so I won’t need the picture after tracing it. No matter what my settings were, I could not get the eyes, nose and teeth to be traced. This is because they are colored parts of the png, so the software couldn’t differentiate between them and the skull. I chose to trace the outline first, then do the inside elements separate. Since the teeth are basically the same color as the skull, I couldn’t get them to trace cleanly. Notice all the yellow dots. I could have gone back and deleted them all, but it is easier to just use the drawing tools. I used the circle tool to make an oval about the shape of one tooth, I then used the point editing tool to match the shape of one tooth. Using the Replicate tool box, I made copies of the teeth and aligned them with the original picture. Since I no longer need the picture, I can delete it, or just move it off the mat. One part of the bones needs to be removed because this is where the party hat will be. Using the knife tool I simply drew a line through the bone, making sure that “solid” is selected in my tool box. If you don’t have the designer edition of the software this is the default setting. This portion of the bone can now be deleted. I then went back and smoothed the part of the skull where I made the cut. 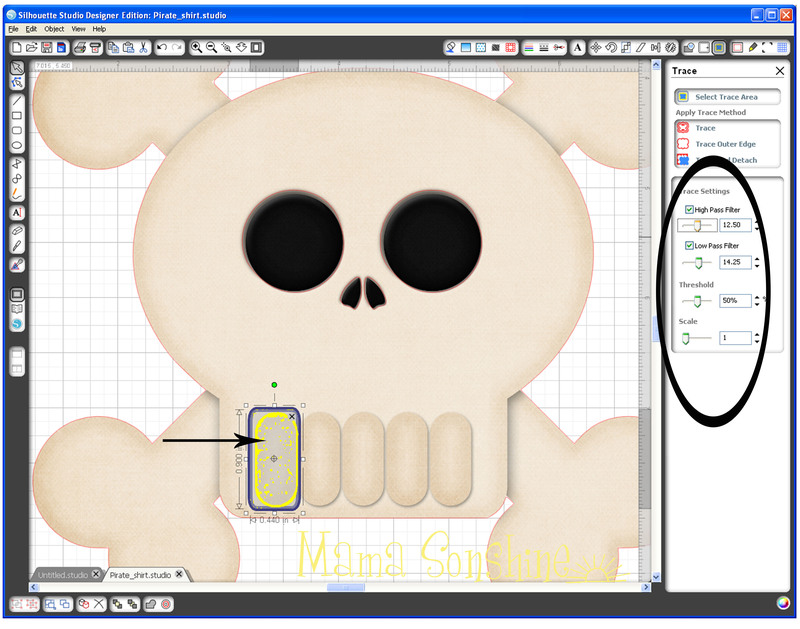 Using the point editing tool box, I deleted all points above the curve of the skull and smoothed out the remaining ones. 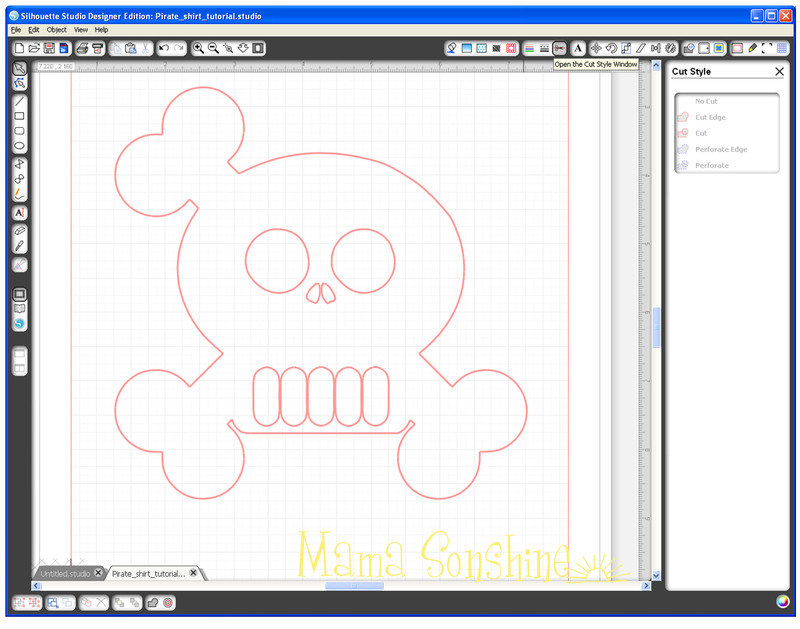 It is not shown in this tutorial, but I also added curved lines to separate the skull and reaming three bones. I didn’t want the separate but I wanted a cut line there to give more depth to the finished product. 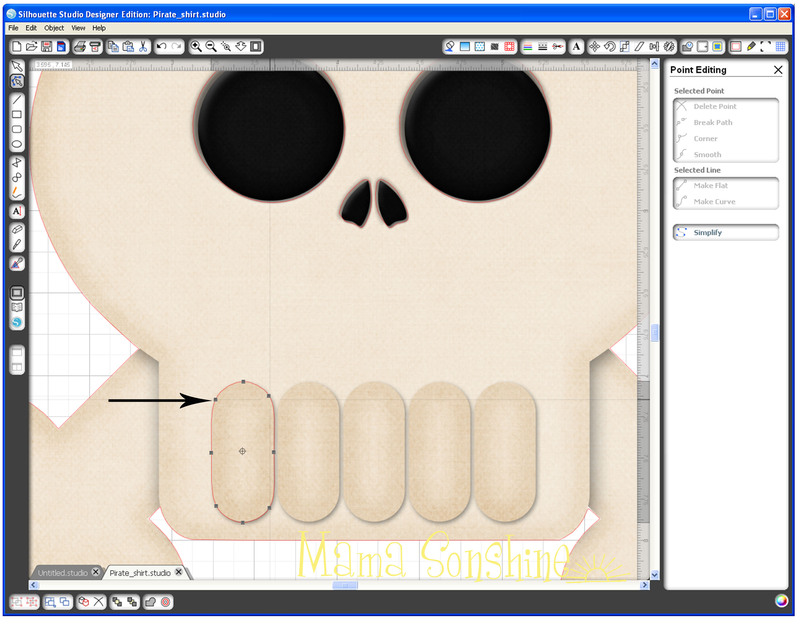 In the cut style tool box make sure “cut” is selected so that it also cuts out the eyes, nose and teeth. The shirt will show through on these parts. Before you actually cut your design you want to flip it horizontally, make sure all elements are selected (ok to group them together). 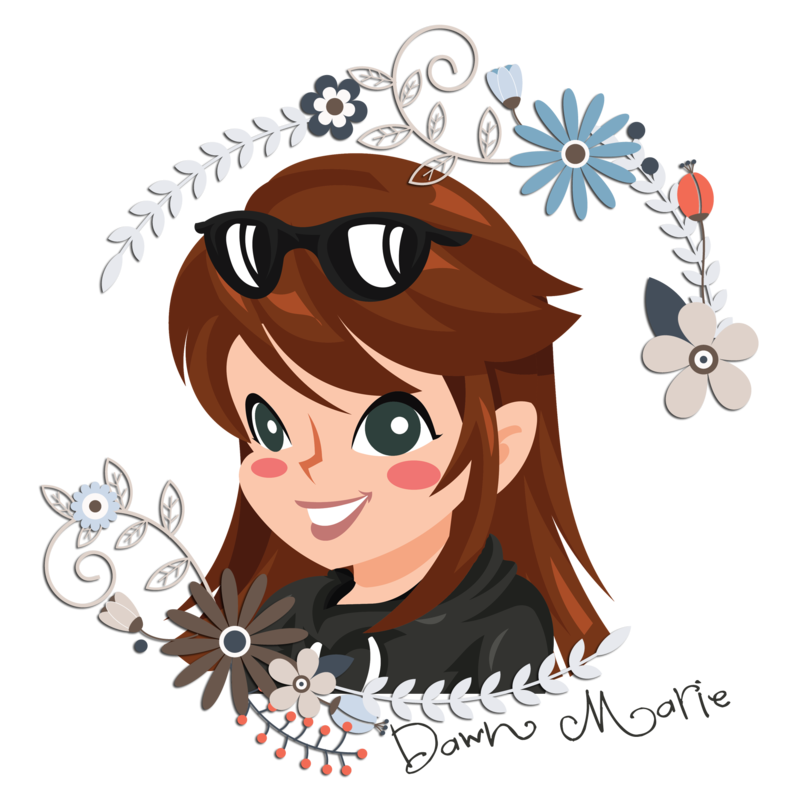 You can right-click, or go to the edit menu, and select ‘flip horizontally.’ The cut settings for Heat Transfer Material Flocked worked perfect because it is a Silhouette media. If you are unsure make a test cut first. You don’t need a mat, so un-click that box and make sure the shiny side is down when cutting. If unsure, follow the directions on the package. For the rest of the shirt check out Part Two & Part Three. 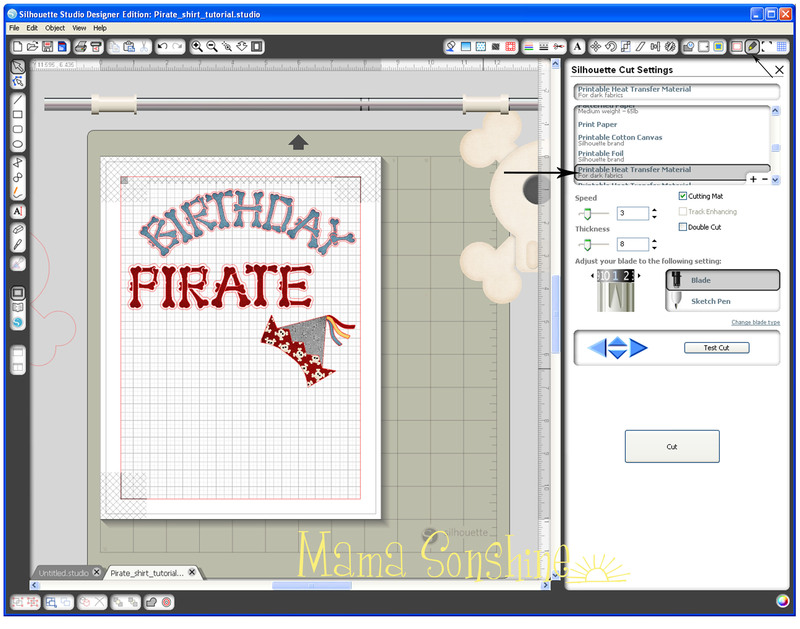 Categories: Birthday, Birthday Party, Parties, She's Crafty, Silhouette Crafts | Tags: Birthday Shirt, Birthday Shirt Tutorial, Children, Crafting, DIY Shirt, Family, Heat transfer, Heat Transfer Tutorial, Printable Heat Transfer, Silhouette America, Silhouette Cameo, Silhouette cutting machine, Silhouette Fabric, Silhouette Fabric Ideas, Silhouette Studio Software, Silhouette Studio Tutorial, Toddlers, Tracing Silhouette Studio | Permalink.